The two severe crises in Ukraine with the Russian Federation as well as in Iraq and Syria with the IS terror regime, not to forget a fragile situation in Afghanistan and neighboring Pakistan, once again show the need for a credible defense capability within NATO and a fresh active approach we call NATO 3.0. In Chinese thinking ‘crisis’ also stands for the time of change. Let us use this mindset to reform NATO now not only with words, but with actions. We would once again like to draw attention to the proposals of twenty respected military and foreign affairs experts from nine different NATO countries presented just 12 months ago for an active alliance in a paper called NATO 3.0, published by the international World Security Network Foundation. Download the full report "NATO 3.0 - Fresh Proposals by the World Security Network" here. These proposals are now more important than ever. 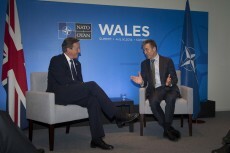 NATO can no longer be successful with mere case-by-case short-term crisis management. Its members need to be proactively shaping reality instead of adjusting to it and acting too late when the costs of lives and resources are at their peak. In Ukraine, NATO is late again, as with the support for the Kurds against IS/ISIS. No more nice demands on paper in communiqués but real actions and implementations by all member states. No more blocking of the necessary reforms in the Alliance at the national level, but co-ownership of the NATO Headquarters in an urgent reform process with the 28 Heads of Member States. A list of short- and long-term reform steps, including timetables, price tags and a control mechanism to check up on progress. A totally new setup, fresh dynamic and ongoing reform process in all member states initiated by a well coordinated, top-down approach from both the NATO Headquarters and Heads of States and Governments. Otherwise, any reform process will fail. A modern, flexible security and defense structure, including maximum cost efficiency. Sufficient national funding of two percent of GDP as a NATO benchmark to avoid further erosion of credible defense and to avoid “provocative weakness” (Fritz Kraemer). Most European allies must invest more in modern defense capabilities, which are their insurance against crisis and war and for liberty and stability. Thus, a comprehensive Smart Defense approach by those member states that are willing to proceed in their mutual cooperation should be made mandatory. A much better link between foreign and defense policies to build up an effective early forward defense against new threats using best practices from all over the world and much more creativity. Embedded, tailored double strategies of power and diplomacy – as was so successfully done with NATO’s Harmel Report in 1967 or in NATOs Two Track Decision in 1979, using multiple soft power tools of peacemaking at an earlier stage to contain threats – while being prepared to fight if needed. To analyze and agree on the new threats and how to contain and deter those unknown risks using the hard and soft elements of peacemaking with detailed but flexible action plans rather than only short-term crisis management when it is very late. The establishment of a NATO Early Warning System in order to identify possible risks, dangers and threats at an early stage and an effective NATO Cyber Defense is clearly justified. This would create new opportunities to put the comprehensive approach into practice. Hence, it would not always need to react to live crises with military intervention – rarely at the right time. To focus on the build-up of responsible elites in our partner countries and partners for peace who promote know-how and shared democratic values based on the UN Charter and the Washington Treaty. A vibrant, strong, globally influential and smart NATO 3.0 needs a solid economic base, much more creativity and fresh thinking, the integration of smart ideas and best practices of peacemaking at an early stage in clever double strategies, sufficient funding, a global outlook and risk assessment and an open debate about options and concrete actions instead of endless talk. Support for the institutions that fight for our common values – as summarized in the UN Charter – must be better structured to prevent or contain instability early enough. In the last 12 months, the United States and NATO failed to support the Kurds. Any containment partner and nation seeking NATO’s help must commit itself to the UN Charter before NATO countries can support it. We cannot strengthen those which do not stand for freedom as defined by the UN but for dictatorship by another name. We must isolate and contain the radicals as well. Going forward, this must be the condition for any political support or NATO intervention in all crises and violent conflicts. In Syria, this approach was missing. NATO partner Turkey is even supporting IS against the PKK. Qatar and Saudi Arabia have pumped more than a billion dollars to fund radicals in these sensitive regions. No investment in mutual understanding will ever be a waste. If we get this wrong, the consequences for world peace and security could be extreme. NATO states need to focus on cultural awareness and widen their U.S. or European-centric worldview in their defense cooperation, planning and interventions. Our 28 national governments and bureaucracies constitute the main adversarial challenge - we are our own worst enemy. Experience shows that at the end of a frustrating, grinding decision-making process, we usually burn too much money for little output and are too slow, uncoordinated, and inefficient. This dreadful ‘red tape monster’ is harder to fight than any enemy. It is the Alliance’s main Achilles Heel, causing us to win on the battlefield but lose in the long-term and to produce one ‘lost victory’ after another. Our enemies often do not constitute the main and only threat, which is, rather, our system’s inability to enable our nations to deal effectively and creatively with them. This must be radically changed now as part of a fresh NATO 3.0 approach. Proactive policy is missing in standing up for our values -the ‘Holy Flame’ of the UN Charter- and a better future for our children. The subjunctive has taken over. A growing number of problems are merely being described, but few are being processed and none mastered. We are not acting, but instead becoming the object of action- see Ukraine or Iraq. We are not shaping, but instead reacting to new developments- see both current crises. Thus, we are losing influence and reputation. In view of today’s paradigmatic shift in foreign policy, what is needed is a new neutralizing of the numerous time bombs, large and small, that endanger our security, alongside a policy of preventive stabilization within NATO, transcending traditional deterrence. Proactive rather than reactive actions are essential. We must collect, evaluate, strengthen, and implement best practices on a global scale, using all assets including intelligence. Until now, this learning process appears to have been overly bureaucratic, slow and lacking in dynamism. We must analyze and assess well beyond the existing limitations towards political and military thought, and begin to deliberate in new and broader international networks and coalitions. What is needed is a proactive security policy that identifies and addresses several areas of crisis and conflict before they become a military threat and a new set of preventive and forward-looking defense and stabilization plans with a focus on the containment of radicals, good government, development programs and partnership initiatives with the EU and UN. NATO and its member states should act at the right/appropriate time – before violent conflicts break out – i.e., with a preventive containment policy, and not when the costs of intervention appear to be too high. A NATO Early Warning System for identifying potential crises or conflict areas or issues needs to be established. Once a year, NATO should publish an annual NATO Global Risk Report, which should include proposals for actions to safeguard the Alliance and support the stabilization of the world, with a focus on MENA and failed states. The non-military elements and instruments of peacemaking must be better integrated as soft factors into a united foreign, security and defense policy approach. We need a double track of strength/power and diplomacy – as was demonstrated so successfully over decades with the Harmel Report from 1967 and NATO’s Two Track Decisions from 1979. For all areas of global conflict, we need new and preventive NATO double strategies tailored to the special conditions, plus special adapted forces. Additionally we need the clear will to deter and defend with all instruments of politics. NATO must – as a condition sine qua non – always establish a detailed and comprehensive strategy and an action plan before it activates its forces. These detailed and plausible plans must include a timeframe with possible exit scenarios, cost-calculations and sufficient funding, best practices from past conflicts, consider the local will of the people involved and negotiations with the adversary from the beginning or reconciliation options - following the advice of Carl von Clausewitz. NATO should set up a NATO Reconstruction Planning Organization, most probably based on a network of existing institutions, like the RCDS or NATO Defense College. This organization could be virtual, helping to deliver modules in existing institutions and courses. Aspects of this new organization could include networking with the right experts; focusing on ‘Golden Bridges’ for all: reconstruction emphasizing hope, self-respect and self-determination; truth and reconciliation; peace talks with the enemies from the beginning, looking for a long-term political solution; military and civilian planning; reeducation and the use of the diasporas and massive support for the local and younger ‘responsibility-elites’. NATO should also establish a NATO Soft Peacemaking Center for non-military emergencies and crisis response. It can be built around elements of the International Staff of the NATO Headquarters like ‘Science for Peace and Security’ and ‘Civil Emergency Planning’. This new task force should collect best practices on how best to support the containment of instabilities (as we see now in Iraq/Syria or Ukraine). It must assemble and organize the national and international know-how of all non-military, civil factors in crisis response and peacemaking from the NATO missions in Afghanistan and other out-of-area conflicts, like those in Libya and Iraq, so it is reasonably accessible for future missions. To make best use of the know-how of our soldiers, NATO should establish two large NATO Mentoring and People-to-People Programs with 100,000 mentees per year. Experienced former officers recruited as mentors can thus transfer their know-how and moral values to the next generation within NATO and to other forces in countries of special interest (like Afghanistan, Libya, Mali, or Syria). For this task, we require thousands of experienced personalities capable of conveying guidelines for life to the most talented young individuals and devoting much time to them. Once a year, NATO could host a Global NATO Town Hall Meeting in different capitals and invite one thousand representatives of non-governmental organizations to discuss issues of peace and stability with NATO officials and make proposals for the future. In a globalized world, different people’s networks and NGOs play an important role. They add unique wisdom, engagement and millions of young activists and concerned global citizens. NATO must better use and integrate these NGOs and social networks into its discussion process and thus add creativity and mutual understanding. NATO should establish formal diplomatic special relationships and liaison offices with new players like the Arab League, Gulf Cooperation Council and even the People’s Republic of China and our Pacific value partners in Japan and Australia. A fresh NATO 3.0 depends on sufficient and modern defense capabilities, which must be preserved and funded adequately, especially in all European countries. In times of restrained funding, it uses creativity and a steady reform process with a modern smart defense structure to produce the maximum (defense efficiency) with the limited resources (of cash). Without this, the NATO shell will lack a core and the forces of progress would be naked and defenseless, with provocative weaknesses in a demanding world. Only a politically strong and coherent NATO with adequate military and non-military capabilities can credibly deter aggression, contain threats, prevent and respond effectively to crises and thus be a lasting and high lighthouse of freedom and for peace and stability. NATO 3.0 rests on the basis of the classic policy of power and national interests, but continues its development in a globalized world with new risks, dangers and threats. It provides a link between the indispensable hard factors and the important, manifold, and often overlooked soft factors of crisis response and peace making aimed at tailored, innovative double strategies for peace and liberty. It uses adaptable long-term planning, including all elements of best practices, timing and funding, to enable NATO countries to use military forces in interventions if required, where it promotes a double approach of power and reconciliation. It is a smart forward defense and flexible response in its use of all soft factors and the best practices of peacemaking by active and engaged foreign affairs and the development policies of the nations involved. NATO 3.0 activates the new global elites for responsible improvement of the world in all areas based on the moral foundation of the UN Charter and human rights. Its additional instruments are global networks, knowledge transfer through mentoring programs, creativity, passion, promotion of the human Codes of Tolerance and Respect (see www.codesoftolerance.com), the containment of radicals, improved planning and control, as well as the large commitment of leaders and individuals. This newly designed NATO 3.0 policy is creative, preventative, action-oriented, extensive, cost-minded, cooperative and profound. It combines political determination with adequate capabilities for engagement as required.